Import,Export and sale of Oil and Oil products and petrochemicals. Mashael Bahrain Petroleum Trading Establishment. Wholesale and retail trade ,import and export waste oil and gas derivatives, and petroleum products, oils and asphalt own gears, brakes, lubricants, fuels and materials mixing oil and used oil collection derivatives and heavy/light petroleum residues . MY Energy Petroleum: Investments in big projects in Oil Industry. 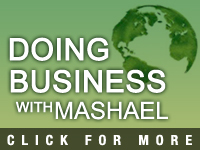 Al Mashael Trading: General Trade Export and Import. Representing Foreign Commercial & Industrial Company nonoperating in Bahrain. Representatives and agents of foreign branches and companies licensed in Bahrain. Import,Export and sale of Motor-cars,buses,trucks and Heavy Machinery and their spare parts.